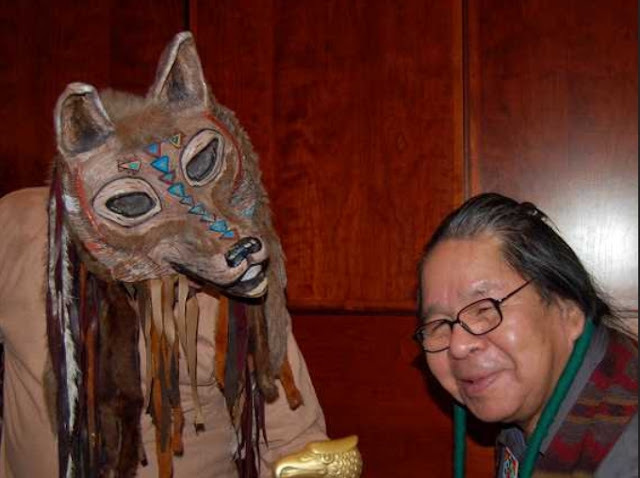 White Wolf : Native American storyteller tells the legend of "She Who Watches"
Native American storyteller tells the legend of "She Who Watches"
Master Storyteller Ed Edmo tells the legend of She Who Watches" -- the famous Native American rock art. Edmo is a poet, playwright, performer, traditional storyteller, tour guide and lecturer on Northwest tribal culture. He has offered guided tours to the She Who Watches petroglyphs on the Columbia Gorge, as well as to the Warm Springs Indian Reservation in central Oregon’s high desert country. He conducts workshops and lectures on cultural understanding and awareness, and lives in Portland with his family. Prepare to laugh and learn from the many adventures of Coyote — one of the most pivotal and important indigenous characters of North American mythology. Responses to "Native American storyteller tells the legend of "She Who Watches""
This is great - thank you so much for posting. I grew up in The Dalles and knew of the Edmo family. Thanks for posting the video. Thank you, this is a wonderful about She who watches. Regarding Indian Time, a dear lady would invite us for dinner but it seemed we were always about an hour late so she reset the time when she it figured out. Anyways, we were ALWAYS on time to eat till the hour reset took place so we would be on her time. The story of Indian Time came home as I read it.